Today's Nanos is out, and it's a dead heat between the Liberals and Conservatives. The NDP has fallen slightly further behind, now 6 points behind its competitors. Outside Québec, all parties are within their usual ranges. In Québec, while changes have been small over the past 3 days, the NDP reached a new low (34%), while the Tories and Bloc reached new highs (20%, 19%) in the Nanos nightly tracking. The latest Ipsos poll for Global confirms the trends that other polls have been indicating: the Conservatives are gaining, while the NDP is dropping. Last week, Ipsos was an outlier in giving the Liberals a 9-point lead in ON; that has been erased, consistently with other polls showing a Lib/Con near-tie there. So while the Liberal national lead looks good on the surface, this is actually not a good poll for the Grits. As for the NDP, this is their best result in ON (27%) since the 9/9-15 EKOS poll, but Nanos has the NDP relatively low there (21.4%). So the best bet is that the NDP is, in fact, stable in ON, around 24% (unadjusted). Abacus, Nanos: Where Is the NDP Losing Support? Two national polls this morning: the daily Nanos, and an Abacus poll with a nice sample. These are the first polls conducted entirely after the French debate. 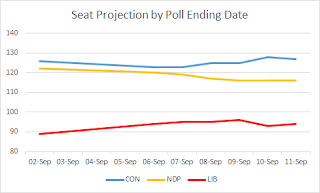 Relative to the last independent Nanos 3 days ago, Nanos has the NDP down 4.2 points nationally, and the Conservatives up 4.1 points nationally. These shifts are right on the edge of statistical significance, meaning that if nothing were happening in reality, there would only be a 5% chance that we'd see them. The NDP has lost 5-6 points in Atlantic Canada, Québec and Ontario, while Conservative support has increased mainly in Ontario, the Prairies, and Western Canada. The Bloc is up 7 points in Québec. The Abacus poll shows similar movement nationally, but has a somewhat different provincial take. The NDP dropped 4 points and the Conservatives gained 3 points in the past 2 weeks. But regionally, the NDP suffered a large drop only in Québec, all the way from 47% to 30%, with also a smaller drop in BC wiping out its lead there. Similarly, the only large gain by the Conservatives was in Québec, where they doubled their vote share from 10% to 20%. Consistent with Nanos, the Bloc was also up 6 points in Québec. There were also three Forum riding polls. In Ottawa West--Nepean, the Liberal projected gain finds corroboration in the poll. In Edmonton Centre, the adjustment made to the model in favour of the Conservatives, which was based on an Environics poll, finds support. And in St. Albert--Edmonton, ex-Tory independent incumbent Brent Rathgeber is closing in, but the Conservatives still hold a lead. No further riding adjustment is thus needed. The NDP lost two more seats in Québec. 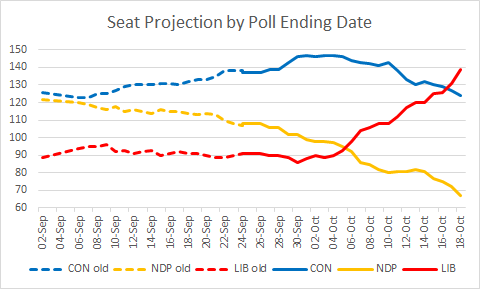 This trend will only accelerate if Abacus is right: the polling average (which puts roughly 30% weight on today's two polls combined) puts the NDP at 36% there, but Abacus has them at 30%. Probe research released the first Manitoba-only poll of the campaign, with 1,000 respondents. The Liberals are outperforming the projection based on combined MB/SK figures, while the NDP is underperforming. - The NDP could lose Churchill--Keewatinok Aski to the Liberals (Grits lead by 13% over the NDP among First Nations), and Elmwood--Transcona could stay Conservative. That would leave the NDP with only Winnipeg Centre. - The Tories could lose Charleswood--St. James--Assiniboia--Headingley to the Liberals. I won't change the model until there is corroboration that the Liberals are indeed doing better in MB (and the NDP worse) than implied by aggregate MB/SK numbers. While August polls by EKOS and Mainstreet also suggested so, the September EKOS polls did not. This is a plausible hypothesis due to the unpopularity of the NDP provincial government in MB. 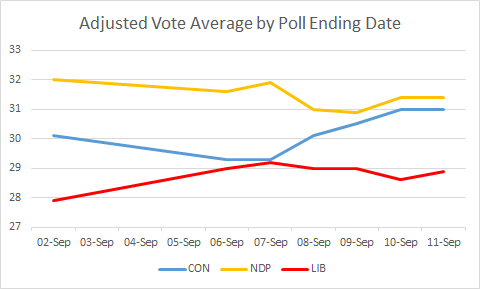 For a few days, the NDP had relatively good numbers in the Nanos poll, even while other pollsters had it trending down. That is no longer true: the NDP just lost 2.7 points in today's release, dropping to almost 4 points below the Tories and 5 below the Liberals. The question is whether this movement is merely Nanos picking up what showed up elsewhere a bit earlier, or if this is a further slide precipitated by Thursday's debate. 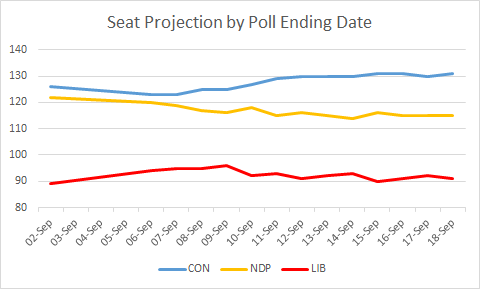 The unadjusted seat projection is also unchanged, with the polling averages now at CON 31.3%, LIB 30.0%, NDP 28.2%, GRN 5.6%, BQ 3.9%. 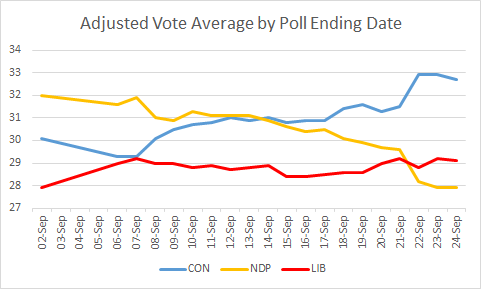 Today's Nanos is out, and as might have been expected, yesterday's relatively bad Conservative number and good Liberal and NDP numbers were tempered. There were no dramatic changes. Note that this projection, like all future ones, is based on a new version of the model that incorporates riding polls and regional breakdowns. The exact changes are described in this post. This explains the sudden shift in NS, where the Liberals jumped to 9 seats out of 11, but as observed here, with current numbers, the net national effect of the update is negligible. You might wonder why the turnout adjustment often makes the Bloc's seat count lower, but its vote share higher. That's because the adjustment reduces the Bloc's share of the Québec vote, but also takes into account the fact that, in the past, turnout has tended to be higher in Québec than in the rest of Canada. - NS: LIB +3, NDP -1, CON -2. The Tories are wiped out from NS due to the adjustments in Central Nova and Cumberland--Colchester. The compensation for the NB adjustment is currently enough to tip South Shore--St. Margaret's from the NDP to the Liberals. - NB: CON +1, LIB -1. NB is projected to swing less violently against the Conservatives than the rest of Atlantic Canada, currently allowing them to keep Miramichi--Grand Lake. - QC: NDP +1, CON -1. The NDP keeps Jonquière thanks to the adjustment there. - ON: NDP +1, LIB -1. The adjustment in Toronto takes from the Liberals Eglinton--Lawrence (to CPC), York Centre (to CPC) and Beaches--East York (to NDP). (Without the adjustment, the Tories would be completely wiped out in Toronto. Even with the adjustment, the NDP will likely not win a single seat in the 905.) However, the Liberals get back Sault Ste. Marie due to the Northern ON adjustment, and Hamilton West--Ancaster--Dundas due to the compensation in the rest of ON. - AB: CON +1, LIB -1. The Liberals' sole AB projected seat, Edmonton Centre, goes back to the Tories. There are currently 51 races decided by 5% or less in the projection, and 51 more decided by between 5% and 10%. Where are they? Note that over half the seats in the Toronto area are close, and all 30 of those races involve a Liberal in contention. Guess where Trudeau will be spending lots of time in the next 3 weeks? BC also has disproportionately many close races: 45% of the races there, both in the Vancouver area and elsewhere, are tight. By contrast, in the remainder of the country, only 22% of the races are close. It is therefore time to fine tune the seat projection model! Below, I review the evidence that swings within the country's six polling areas (Atlantic, QC, ON, MB/SK, AB, BC) are not uniform. For each polling area, Part 1 discusses sub-regional breakdowns, and Part 2 discusses riding polls. The changes that I am making to the projection model are in bold. - I compare the data to the projection based on national and provincial polls conducted during roughly the same period. - In the case of regional breakdowns, I make no adjustment if all parties are within 3% of the projected vote share. - In the case of riding polls, I make no adjustment if all parties are within 10% of the projected vote share. That is, I'm trying to be parsimonious, with the idea that a projection model isn't trying to correctly project every riding, but rather that errors in different directions should roughly cancel out. - I also make no adjustment if an adjustment won't matter unless there is an extreme swing. For example, if the projection in a riding is 45-40-15, and the poll says 50-45-5, there is no adjustment since party #3 is unlikely to win anyway. - Adjustments do not make the projection fully match the poll - they only go part of the way. How far depends on whether there is corroborating evidence, and on whether I know of a good reason for the deviation (e.g. star candidate, by-election, etc.). - Any regional adjustment must be cancelled by an equivalent adjustment elsewhere in the same polling area. For example, to balance out adding 5 points for the Greens on Vancouver Island, I subtract 1 point for them elsewhere in BC. I will issue a projection with the new model shortly. 1. CRA published a poll of about 1,500 Atlantic Canada respondents with a breakdown for the four provinces, conducted during August. a) The notable deviations occurred in PEI, where the Liberal change from 2011 was 13.7 points worse than in Atlantic Canada as a whole. Of course, PEI sample sizes are small, but the CRA poll in May also showed a Liberal change 9.7 points worse in PEI than in Atlantic Canada. The Tories also slightly underperform in PEI (by an average of 4.8 in the two polls, which is statistically insignificant), so the gainers are the NDP and the Greens. Due to the small sample sizes, the adjustment won't go as far as the poll is suggesting: in PEI, it's -9 for Liberals, -2 for Tories, +7 for NDP, +4 for Greens. This cuts the Liberal/NDP gap in half in Charlottetown (but the Liberals still have a big lead there), and makes Egmont a really tight Liberal/Conservative race. b) No big deviation in NB relative to Atlantic Canada as a whole, but for several elections, NB has tracked ON more closely than it has tracked other Atlantic provinces. And indeed, assigning the ON changes to NB would have yielded even closer numbers to what CRA shows for NB. 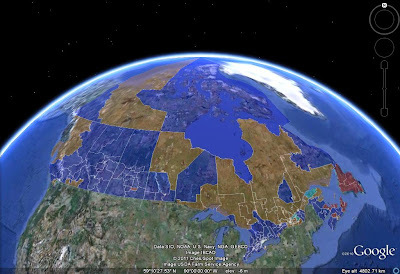 However, demographically, NB is much more similar to its Atlantic brethren than to ON. What to do? This is where I use another source of information: riding polls. 2. I know of 8 ridings polls in 5 ridings here. - Three riding polls in two ridings in NB: St. John--Rothesay and Fredericton. In both cases, the Conservative-Liberal difference is about 5% better for the Tories than what the Atlantic uniform swing would yield. At the same time, using the ON uniform swing would yield a 16% difference in favour of Tories. Therefore, to address both these polls and point 1b above, for NB, I will use a weighted average of 2/3 Atlantic swing, 1/3 ON swing. - In Avalon, ex-Liberal independent incumbent Scott Andrews appears to draw from all three main parties, and is only at 19%. Thus, no adjustment is necessary. - In Cumberland--Colchester, two polls in the past week both have ex-Tory Liberal candidate Bill Casey with about 50% of the vote. This is way above the uniform swing projection, and is almost entirely at the expense of the NDP. I am going with the poll that's closer to the uniform swing projection: in Cumberland--Colchester, +10 for Liberals, -10 for NDP. - In Central Nova, Peter MacKay's riding, two polls conducted 2-3 days apart tell radically different stories. Mainstreet has Central Nova swing like the rest of Atlantic Canada, leaving the Tories ahead by 6 points. However, Environics has the Liberals with a 27-point lead! Here, I am giving roughly 1/3 weight to Environics: in Central Nova, +5 for Liberals, -5 for Conservatives. Indeed, if Bill Casey is worth 10 points to the Liberals, then it seems reasonable that Peter MacKay would be worth at least 5 points to the Tories in a neighboring riding. In NL and NS, I will make uniform changes that, combined with the above, will net out to zero (in terms of votes, of course) for each party. 1. The only regional breakdown is from a CROP poll in mid-August; Mainstreet also conducted a poll of the Island of Montréal in late August. Taken together, they do not offer evidence that an adjustment is needed. - In Papineau, last week's Mainstreet poll has the Conservatives and NDP outperforming uniform swing, and the Liberals and Bloc underperform it. It's quite hard to see why the Conservatives, who got 5% in 2011, would suddenly be at 11%. It's also surprising that Trudeau would not only miss out on the party leader bump, but actually suffer from a penalty. On the other hand, it's quite easy to see separatists voting NDP to spite Trudeau. In Papineau, +5 for NDP, -5 for Bloc. - This week's Mainstreet poll found a similar pattern in the nearby riding of Ahuntsic--Cartierville. In Ahuntsic--Cartierville, +5 for NDP, -5 for Bloc. - In the Conservatives' sole target seat in the Montréal area, Mount Royal, they are performing worse than expected. In Mount Royal, -5 for Conservatives, +5 for Bloc. - In Richmond--Arthabaska, popular incumbent André Bellavance, elected as a Bloc MP in 2011, is not running. The Bloc vote collapsed according to a Mainstreet poll. In Richmond--Arthabaska, +10 for Conservatives, -10 for Bloc. - The three ridings of the Saguenay--Lac-St-Jean region were polled by Segma last week. The Tories underperformed their provincial swing across the board. The biggest beneficiaries were the Bloc in Jonquière and Lac-St-Jean, and the spoils were split between the Liberals and NDP in Chicoutimi--Le Fjord. In the three Saguenay--Lac-St-Jean ridings, -5 for Conservatives, +5 for Bloc (except in Chicoutimi--Le Fjord, +2.5 apiece for NDP and Liberals). - In the 905, the Tories have dropped by slightly more than in ON as a whole, and the NDP is doing slightly better. - For the Conservatives, +5 in the city of Toronto, -3 in the 905, and -1 in the rest of southern ON to balance things out. - For the NDP, +2 in the 905, and -5 in northern ON. - For the Liberals, -5 in the city of Toronto, +5 in northern ON, and +1 in the rest of ON to balance things out. 2. There have been at least 33 riding polls in 23 ridings in Ontario. They are, on the whole, consistent with the adjustments above. While I could further adjust some ridings, these changes would mostly cancel out in terms of the seat count, so I will leave things alone. 1. EKOS' weekly poll provides separate numbers for MB and SK, and large sample polls conducted by Mainstreet and Angus Reid in August did the same. Moreover, Insightrix conducted a SK-only poll, also in August. Taken as a whole, there is no strong evidence that MB and SK are moving differently relative to 2011. - Winnipeg South Centre: -5 for Liberals, +2.5 apiece for NDP and Conservatives. Liberal lead much smaller in poll than in projection. - Saint Boniface--Saint Vital: -5 for Liberals, +5 for NDP. Again, Liberal lead smaller than in projection. - Regina--Lewvan: +5 for Conservatives, -5 for NDP. This reduces the NDP lead; Tories actually ahead in the poll. - Saskatoon West: +5 for Liberals, -5 for NDP. NDP lead much smaller in poll than in projection. 1. Two Insights West poll provided a regional breakdown. No adjustment needed. - Edmonton Centre, a three-way race with uniform swing, was in fact a two-way Conservative/NDP race in an Environics poll conducted last week due to Liberal underperformance, which mostly benefits the Tories. In Edmonton Centre, +5 for Conservatives, -5 for Liberals. - In St. Albert--Edmonton, the ex-Tory independent incumbent Brent Rathgeber is drawing proportionally from all major parties and far from winning. This is a very similar situation to Avalon. No adjustment needed. - In Lethbridge, where much loathed incumbent Jim Hillyer (who hid from a reporter by running into a bathroom in 2011) decided to run in a neighboring (and safer) riding, the Tories appear to be recovering from his negative effect in 2011. In Lethbridge, +5 for Conservatives, -5 for Liberals. - In Fort McMurray--Cold Lake, the Liberal candidate that ran a strong second in last year's by-election is running again, and seems to have carried some momentum. In Fort McMurray--Cold Lake, +10 for Liberals, -10 for Conservatives. - In Calgary Confederation, a particularly strong Green run in 2011 does not seem to be repeating itself, allowing the Liberals to be very competitive this time. In Calgary Confederation, +5 for Liberals, -5 for Greens. As the above changes roughly cancel out in terms of votes, no adjustment is necessary in the 30 other ridings. 1. Two Insights West polls and a Mainstreet poll agree: swings in Metro Vancouver closely mirror swings in the rest of BC. On Vancouver Island, however, the Greens have increased their support more than elsewhere, mainly at the expense of the NDP. On Vancouver Island, +5 for Greens, -5 for NDP. To balance this out: in the rest of BC, +1 for NDP, -1 for Greens. 2. There have been 16 riding polls in 13 ridings in BC. Something quite odd is going on: the Liberals are underperforming what they would get under uniform swing in ALL of them. There might be a house effect at play here: all 16 polls were conducted either by Environics or by Insights West. The one riding where the difference is especially large is Vancouver Granville. There, while uniform swing puts the Liberals about 20 points ahead, both Environics polls have them behind the NDP (12 points in August, 6 points this week), with the Tories also in the mix. I will go with about 2/3 of the adjustment corresponding to the average of the two polls: in Vancouver Granville, +5 for NDP, +7 for Conservatives, -12 for Liberals. This makes Vancouver Granville a three-way toss-up. The Environics poll this week confirmed the Liberal lead in the Yukon, though it is a bit smaller than with a national uniform swing. The big difference is that a strong Green candidate is not running this time, and his votes seem to all go to the NDP, which is competitive as a result (but still 10 points behind the Liberals). In the Yukon, +15 for NDP, -15 for Greens. Given that pollsters seem to be getting faster at reporting (i.e. they now usually release polls 1-2 days after their conclusion rather than up to 3-4 days), I will move my weekly trend posts from Saturday to Friday. Also, given the coming update to the projection model (in order to incorporate information from regional breakdowns and riding polls), this is a good time to look at the trends given by the current model. In the past 7 days, the Tories have gained 8 seats, while the NDP dropped as many. Much of these changes occurred in Québec. The Liberals were essentially flat, losing one seat, while the Bloc got on the board with one seat. 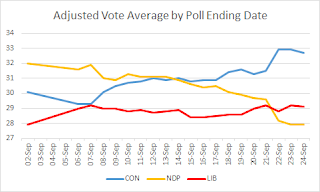 The popular vote graph shows the same tendencies, although here, one clearly sees the effect of the EKOS poll, with a massive bump for the Tories and a massive drop for the NDP on Sept. 22. 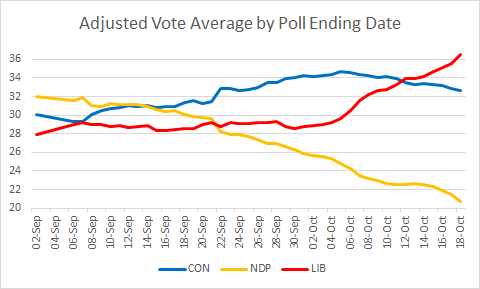 However, the down trend for the NDP is unmistakable, even without the EKOS poll: it has dropped 2.6% in the past seven days, and would have dropped 1.9% even if EKOS had not reported. Similarly, Tory gains were also clear: of the five pollsters that have reported in the last two days, only Nanos fails to have the Conservatives at least tied for the lead. As for the Liberals, they have been almost entirely flat since Sept. 7. Innovative Research did something, well, innovative: it conducted parallel phone and online polls. The results come somewhere between the EKOS and the other polls: Innovative places the Tories in the lead, but not by nearly as much as EKOS. The Liberals were a tad lower than their usual 31% in the other non-EKOS polls; however, they can rejoice that both Innovative polls still give them a small lead in Ontario. The Greens were high in both polls: 7% in the phone one and 8% in the online one. After yesterday's EKOS bombshell, Canadian political junkies are on high alert, looking for any further evidence of movement of voting intention toward Conservatives. 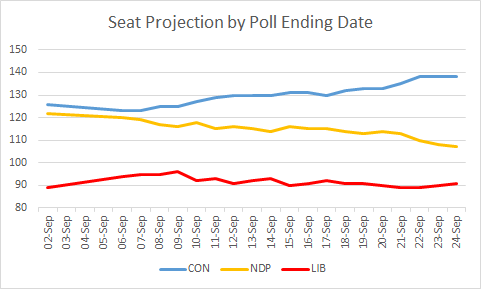 Today's polls do not show such a change: Forum has the Tories down by 2 compared to last Friday, while Nanos has them down by 2.4 compared to three days ago. One place where Forum corroborated EKOS is a low NDP number in Québec: EKOS had them at 33% there, Forum 34%. However, Nanos still has the NDP at 41% in QC. As for the Liberals, they have had a good polling week apart from EKOS: the most recent poll of all other pollsters that have reported this week (Ipsos, Forum, Léger, Nanos) puts the Liberals first (in a tie in two cases). Either this evening or over the weekend, I will update the projection model based on regional breakdowns and riding polls. Stay tuned for a big post reviewing all of those since the start of the campaign! The details of the EKOS poll that's been much discussed since last night have been posted. The Tories outperform other polls by about 5 points, while the NDP and the Liberals both underperform by about 5 points. (The Greens and "Others" were also high.) The result is a national race that isn't even close. - The sample size of 2,343 was reasonably large. - EKOS did not apply a likely voter screen (which might have explained the high Conservative numbers, but would have made the high Green numbers puzzling). - In recent polls, EKOS tended to have the Tories a bit high, and the NDP and especially Liberals a bit low, but the discrepancies were never anywhere close to this large. - Tories outperformed the polling average by a consistent margin everywhere - there is no rogue region where the Conservative number was obviously an outlier. Yes, the Bloc is right at the place where they start taking seats from the NDP. Expect fireworks at tonight's debate! A bunch of polls out this morning. The usual Nanos shows the usual results: not much change. The Léger numbers are all very much in line with the polling average, though the NDP is down to 38% in Québec, while the Bloc is up to 20%. That's the area where the Bloc would start winning seats, so that "0" in the left-hand column might finally change soon! Finally, Mainstreet has an ON-only poll putting the Tories ahead by 4 over the Liberals and 16 over the NDP. These numbers are a little higher for the Tories and lower for the Liberals and NDP than usual, but they are not out-of-whack. The unadjusted averages are LIB 30.4, NDP 30.1, CON 30.0, GRN 4.9, BQ 3.9. Today's Nanos poll shows, once again, little notable variation from yesterday's, other than another change in lead that has the Liberals marginally in front of the Conservatives. The notable change in the projection is that the NDP has now slid to third place in the adjusted polling average, behind the Liberals. However, the NDP retains a healthy seat advantage over their rivals. The main reason for this is the Québec vs. Ontario comparison: in QC, the NDP leads the Liberals by 17.2%, while in ON, the Liberals lead the NDP by 10.6%. In terms of number of people, those are actually roughly the same due to ON's larger population. But while the NDP gets 47 more projected seats than the Liberals in QC, the Liberals get only 24 more projected seats than the NDP in ON. Without the turnout adjustment, the parties have essentially completely converged in the polling average, and the seat count order is the reverse of the vote share order. Today's Nanos poll does not contain any surprising number relative to the poll average. Nevertheless, the 37.8% for the Conservatives in ON is their best number there since the Aug. 1-28 Nanos poll. The unadjusted vote shares for the main parties keep converging: they are now all within 0.5%. - The Conservatives are at their highest point of the campaign. The question is: is this it? If they don't win a majority, or at least open up a large gap in a minority situation, they may not be able to govern. - The NDP has lost its national lead, and it has been steadily losing 0.5-1% per week. If this continues for 4 more weeks, it will finish third. Worse, if it is third going into the last week, strategic voters on the left may flock to the Liberals. Mulcair needs to halt this slide, but with 2.5 of the 3 remaining debates in French and with the NDP Québec seat count nearly "maxed out," there is more downside risk than upside potential. - The Liberals need to break out of the pack in terms of the popular vote: if they don't, the inefficiency of their vote (23% for just 11 seats in Québec, 27% for just 7 seats in BC) will cost them the election. Indeed, the Liberals could well win the popular vote and still finish third. - The Greens are up just 2 points relative to 2011 in BC. Unless close to half of it is concentrated in one riding, which is quite unlikely, they are nowhere close from winning a second seat. - The Bloc is fighting for its life, and the prognosis is not good. Expect Duceppe to go all out attacking Mulcair in the two French debates. The new Ipsos poll is the Liberals' best poll of the campaign (33%), and the first non-Nanos poll to have them in the lead. Particularly encouraging for them is their 9-point lead in ON; however, this does not match what other pollsters are showing, namely a virtual tie between the Grits and Tories there. This is also the third mediocre poll of the day for the NDP in QC: 41.2%, 38%, 37%. It doesn't really matter whether the NDP is at 40% or 45% there (it is still at 42% in the projection), but if it drops below 40%, seat losses would start coming pretty fast. As for the Tories, 27% is very low for them nationally, though part of the weakness comes from an implausibly low 39% in AB. On the day, it's a gain of one seat for the Conservatives, and a loss of one seat for the Grits. However, the unadjusted count below moved in the exact opposite direction, and the Grits are actually the winners in the popular vote, gaining 0.5% while the NDP lost 0.4%. The newest Forum poll is out, and it shows the Tories ahead by 4 points over the NDP and the Liberals. This is the first non-Nanos poll of the campaign where the NDP does not lead the Liberals, and where it is under 30% (if you round the EKOS numbers). 33% is also the highest national number for the Tories so far. Despite the small sample size, no regional number is out-of-whack, except for the NDP at 21% in BC. The Liberals are now back to where they were on Sept. 2 (despite being still up 0.6% on the popular vote), but in the meantime, the Tories gained 9 seats, while the NDP lost 9. NDP 30.6%, CON 30.0%, LIB 29.2%, GRN 5.7%, BQ 3.7%. The NDP is in danger of relinquishing its unadjusted lead for the first time of the campaign. Today's Nanos release is quite boring: no change in order, no party breaking out of recent ranges in any region. 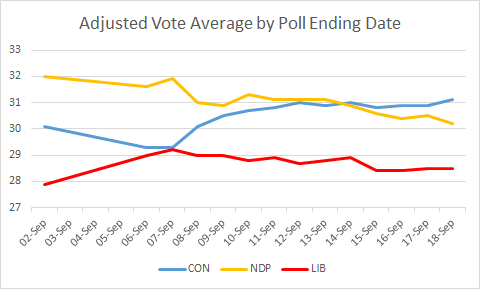 Just like for the period Sept. 11-13, the three Nanos polls ending Sept. 17-19 have identified three different leaders: today's release had the Conservatives in front. The NDP is up marginally, suggesting that the statistically significant drop seen yesterday might have been that 1-in-20 event. The Conservative uptick observed late last week and the NDP's gentle decline both appear to have stopped. However, the picture is somewhat different for the popular vote. 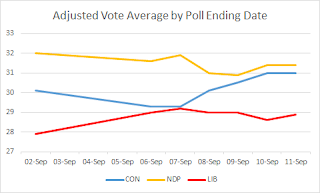 There, the NDP's decline has continued, dropping it into second place in the adjusted average. The Liberals were also marginally down, meaning that their momentum from before Labour Day has definitely stalled. However, rather than the Tories, it is mainly the Greens that have benefited from these changes: you can see that all three main parties dropped from 9/14 to 9/15 since there were four polls concluded on 9/15 that were all good for the Greens. Will next week be as flat? The NDP's statistically significant drop in today's Nanos poll could be an ominous sign for Mulcair (did he lose the debate on the economy? ), or it could be the kind of noise that happens 1 time out of 20 even when there's in fact no movement. Stay tuned. Today's Nanos poll is a little more exciting than usual: the NDP dropped from first to third, recording its worst national number since the start of the campaign: 28.9%. The day-to-day decline of 2.4%, which implies that the NDP was about 7.2% lower in the 9/18 sample than in the 9/15 sample, is (barely) statistically significant at the 95% level. Another day, another change of leader in the Nanos poll: it's the NDP today. After a few days of having the NDP low in Québec (well, around 42%, low by this campaign's standard), Nanos has it back up to 47.8%. On the flip side, Nanos sees the NDP lead gone in BC, which it pegs a virtual three-way tie. Why did the NDP lose seats? That's entirely due to the inclusion of this Mainstreet poll in BC, which has the Tories marginally ahead. Due to the large sample of the poll, 2218 BC respondents, the formula assigns it a high weight: over 33% of the projection for BC. I am not adjusting the national figures to account for this poll, but if I did, the Tories would gain about 0.1% at the expense of the NDP, canceling the popular vote variations you see above. Just after the NDP dropped to its lowest projected seat count and polling average of the campaign, two new polls put it ahead: the weekly EKOS for iPolitics has it barely ahead in a tight three-way race, while the Environics poll put it in the lead by 5 points. No real whopper regionally, with the exception of a 16-point lead for the NDP in MB/SK (clarification: this in the Environics poll) (the Conservatives lead by 11 in the average of other polls). On the day, the Tories have gained two one seats, and the NDP, one two, while the Liberals have lost three. More interestingly, in terms of the popular vote, the big winners of the day are the Greens, gaining one full point at the expense of the NDP and the Liberals. Part of it is due to Environics: this was its first poll of the campaign, and it had the Greens at a high 8%. But Nanos, Forum and EKOS had the Greens up by 1.5%, 3% and 1.7% respectively over their last (independent, in the case of Nanos) poll. This week's Forum poll shows some movement: while the previous two Forum surveys had the NDP at 36%, which was higher than in all contemporaneous surveys, today's release falls in line with other polls, putting the NDP at 30%. Meanwhile, the 32% for the Tories is their best result of the entire campaign. The unadjusted popular vote is now NDP 31.1%, CON 29.9%, LIB 29.6%. For the fifth day in a row, there has been a chance in leader in the Nanos tracking poll for CTV, and in the past six days, each party has led twice. Today's gap between first and third is the smallest yet: just 0.8%. There's a near perfect tie in the popular vote: the Tories lead the NDP by just 0.01% (yes, that's 0.01, not 0.1). Without the adjustment, the NDP still has a small lead: 31.7% vs. 29.8% for the Liberals and 29.3% for the Conservatives. By now, countless articles have been written about how, with the NDP's move to the centre and the Liberals' move to the left, the two parties' economic policies have become very similar. Indeed, various journalists have even mused that the Liberals are now to the left of the NDP. While the scope and objectives of the policies proposed by the two parties are indeed similar, Liberal policies tend to transfer money and then let the market do its work, while NDP policies often attempt to weaken market forces (or quash them altogether) in a populist way. That is, the Liberal economic approach is still much more market-oriented than the NDP one. Below are several major policy planks of the two parties that illustrate this distinction. - The Liberals are proposing a new top bracket of 33% that would finance a cut to the middle bracket to 20.5%. - The NDP is proposing a $15/hour minimum wage that would affect a minority of workers in federally regulated industries. Both of these policies make the system more progressive. They are obviously not targeted to the same people: the Liberals are targeting the middle (and upper middle) class, while the NDP is targeting the working class. The difference I want to emphasize, however, is that the Liberals are proposing to allow the market to clear under rules that favour more redistribution. The NDP, by contrast, wants to push the market farther away from equilibrium (which will likely slightly increase unemployment) by instituting a higher price floor. Note also the populist element of the NDP policy: nobody's tax is getting raised. However, the populism comes at a price: consumers of the affected goods and services will be paying more regardless of their income. - The Liberals want to increase transfers to most families and make them more progressive. - The NDP wants to create a new $15/day national daycare program. Here again, the Liberals are proposing to make the system more progressive while letting people decide how the money is spent. The NDP's answer, on the other hand, is a brand new one-size-fits-all government program. Once again, the NDP is hiding some of the costs of its proposal by requiring provincial contributions that may not be forthcoming. - The Liberals would hike the personal income tax rate for incomes above $200,000 from 29% to 33%. - The NDP would hike the corporate income tax rate from 15% (to a soon-to-be-specified level, probably not above 17.5%). The populist appeal of a corporate tax hike is clear. However, most economists would argue that, from an efficiency standpoint, personal income taxes are preferable (however, value added taxes, such as the GST, are even more efficient). Moreover, a hike in the corporate tax rate would hit all shareholders: rich investors, yes, but also anyone with stocks (or stock-based mutual funds and ETFs) in their RRSPs, and anyone participating in a private or public pension plan, including the CPP. The Liberal policy is closer to economists' advice, while NDP policy has more visceral appeal at the price of being less efficient and more poorly targeted. - The Liberals want to fund a lot of additional investments by running a deficit in the short run. - The NDP wants to fund some additional investments while maintaining a balanced budget. The deficit issue is probably the comparison that led some to believe that the Liberals are now to the left of the NDP. However, fiscal policy is only one aspect of economic policy. More importantly, the Liberal proposal is more responsive to current market conditions (i.e. extremely low interest rates), and the proposed deficits are small enough that the debt-to-GDP ratio, which determines affordability, is not projected to increase. The NDP position is once again populist and lacks nuance ("surplus good, deficit bad"). - The Liberal strategy mainly relies on grants (other than the direct Parks Canada jobs). - The NDP strategy relies partly on grants, and partly on a requirement to hire youth on infrastructure projects with federal funding above $10 million. The NDP approach relies more heavily on additional regulation and on a piecemeal, sectoral approach, focusing on jobs linked specifically with public infrastructure projects - not allowing the market to dictate where those jobs are. It requires smaller grants per job than the Liberal plan, but some of the cost is simply hidden in the requirement put on federally funded infrastructure, which will increase the required budget on those projects. As illustrated above, the Liberals' and NDP's economic platforms are, in fact, quite in line with the parties' respective economic philosophies. (Of course, one can find individual policies that don't fall in line, but the ones outlined above constitute the bulk of the most economically significant ones.) What has changed is that the Liberals are proposing more than they traditionally do, and the NDP is proposing less. But the kinds of policies they're proposing suggest that neither party has fundamentally changed its economic thinking: the Liberals remain more market-friendly, and the NDP remains more statist and populist. This one is simply very close. A Forum riding poll last month had the NDP up by 29%. So if you average the two riding polls, you get close to the projection. This one is more of a head-scratcher. Chris Alexander did get a fair bit of attention in the news two weeks ago, but it was hardly flattering. In any case, either way, he is clearly in danger of losing his seat. The daily Nanos has the NDP back in front, with the Tories dropping two full points. That's a significant drop at the 90% confidence level (though not at the 95% level). The Liberals went from a 1.5% deficit in ON yesterday to a 5.1% lead. The NDP is back in front of the popular vote projection. This is the 7th day in a row where the NDP has been between 30.9% and 31.3%, the Tories between 30.5% and 31.0%, and the Liberals between 28.7% and 29.0%. In other words, trends are flat like Saskatchewan. The Nanos daily tracking poll for CTV is out, and today's numbers show the Tories back in first, with strong gains in Western Canada. However, in Ontario, the Tories are actually slightly weaker than yesterday, so the increase in their national number does not have a large seat projection impact. For the first time since September 2, the Conservatives lead the projected popular vote. But that's entirely due to the turnout adjustment! Without it, the NDP would still be ahead by 2.1% over the Liberals, and the Tories would in fact be third, fractionally trailing the Grits. A new Ipsos poll is out, and the NDP lead has shrunk from 4% to 1%. That's well within the margin of error, though. Regionally notable figures include a low 38% for the NDP in Québec, and a 6% lead for the Liberals over the Conservatives in Ontario. Two polls this morning: the daily Nanos, and a seemingly bi-weekly Abacus. There is really little in the way of notable changes, though both polls have the Conservatives up by 3% over the Liberals in ON, with the NDP still trailing. After teasing us for a few days, Innovative has finally released the regional breakdown of its most recent poll for the Hill Times. It was conducted from 9/4-10, which is the time period where Nanos had the Liberals very high in ON, but where Ipsos, EKOS and Forum disagreed. So perhaps Nanos wasn't an outlier after all - most likely, the truth was somewhere in between, and the Grits had a small lead in ON. The good Liberal number in ON (and AB, where the Liberals now have one projected seat, Edmonton Centre, for the first time) did not translate into a very good number nationally: they are lower than usual in the Atlantic and BC. The NDP is lower than usual in Québec, while the Tories are lower than usual in ON and the Prairies. The daily Nanos is out, and bears bad news for the Liberals in ON: their 7.5% lead over the Tories from yesterday has turned into a 0.4% deficit! Liberals shouldn't panic: this result merely places Nanos in line with other polls published in the past week that show ON to be tight two-way Liberal/Conservative race. Indeed, the only two other polls showing the Liberals with a sizable lead in ON were both conducted just before the story of Alan Kurdi emerged (Forum 8/30-9/1 and Léger 8/31-9/2). - I will plot vote shares (adjusted for turnout) as well as seat counts. - The plots will be made by last polling date rather than by the date of the projection. In particular, if a poll with earlier field dates if published after a poll with later ones, the graphs will reflect retroactive calculations. Here's an example to illustrate the second point above: this week, the Nanos polls conducted 9/5-8, 9/6-9 and 9/8-10 were released on 9/9, 9/10 and 9/11 respectively. Then, later on 9/11, the EKOS poll conducted 9/2-8 was released. The trend graphs reflect not only the updated 9/11 projection (for polling up to 9/10), but also corrected 9/9 and 9/10 projections (for polling up to 9/8 and 9/9, respectively). This retroactive adjustment can be informative: for instance, this week, it helps illustrate that the narrative of Conservatives dropping very low early in the week was exaggerated. 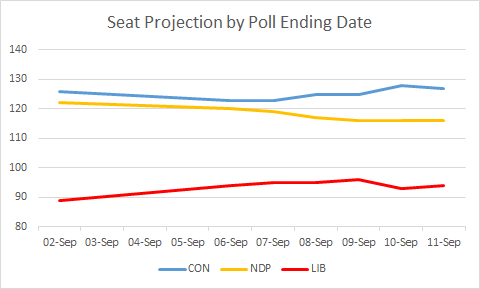 The seat trends this week show a very slow, but steady, NDP decline. The Conservatives followed the NDP trend early in the week, but rebounded late. The Liberals rose in the first part of the week before stabilizing in the last few days. Throughout the week, the Tories were marginally ahead of the NDP for first place; the Liberals have shrunk their gap with the NDP by a third. The vote trends are similar to the seat trends. Note that with the retroactive calculations due to the EKOS poll, the Tories actually never fell below the Liberals. It's important to once again note here that these vote shares include a turnout adjustment; without it, the Tories would be third currently (and second in the seat count). The good news for the NDP is that despite the turnout adjustment, it has led the pack throughout the week, but its lead has shrunk from 1.9% a week ago (and a high of 2.6% mid-week) to just 0.4% currently. Today's Nanos poll for CTV is here, and mostly shows stability. Note that there's also a new Innovative poll for the Hill Times, but it is not included in the projection because only the national numbers for the three main parties are available. Including it would reduce the gap between the Liberals and the two others by about 1/3 of a percentage point. Every week, after the weekly EKOS and quasi-weekly Forum polls come out, I plan on doing a quick overview of the most important trends during the week. As you can see, for all the talk of the Tory campaign going poorly, the big losers of the week are actually the NDP and the Greens! How can that be? 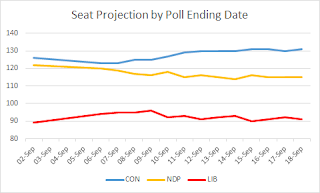 - The Conservatives had some poor numbers in the Forum and Léger polls late last week (which were included in last week's projection, and hence are not part of the changes above), and the Nanos polls early this week. For a while, these were the most up-to-date numbers, and they therefore drove the narrative. However, each of these polls had the Tories unusually low in certain regions of the country: Forum and Léger in Ontario (21% and 28%), and Nanos in BC (as low as 17.5%). Given the most recent Nanos numbers, as well as the EKOS and Forum polls today, it looks like all of these were either transient or simply statistical noise. - What about the changes in the Conservative campaign? Perhaps the Tory internal numbers are poor, and today's EKOS is actually the outlier. But it could also be that the Tories underperformed their expectations, since they were the only party able to spend a lot in the first half of the campaign. Or perhaps they're simply toying with the media: if the narrative is that they're down when they actually aren't, then if they stay stable longer, the narrative will become that the Tories have recovered, potentially generating positive momentum. - What about the NDP? The real big story of the week is that the NDP is probably down in ON, to the profit of the Liberals. I say "probably" since today's Forum poll bucks the trend, but Nanos, EKOS and Ipsos all showed NDP weakness there (though EKOS has the Tories up rather than the Liberals). This has prevented the Conservative seat count from increasing along with its vote share reduced the Conservative seat count increase by shoring up the Liberal vote. The NDP's national numbers are stable, mostly because they've likely made further gains in QC at the expense of the Bloc (though today's EKOS bucks the trend). But these gains have only a small effect on the seat count since the NDP is already almost sweeping QC. - In terms of the popular vote, the biggest losers are the Greens: they have lost 15-20% of their support according to the projection, and are now back to 2011 levels. Perhaps, as people went back to their routines post Labour Day, some also ended their fling with the Greens. Or perhaps, by putting out a very lefty platform, the Greens lost some support from centre-left voters that like neither Mulcair or Trudeau. You may have noticed that I haven't mentioned the West much. That's because the West has actually been quite stable. One narrative that you may hear is that today's EKOS and Forum numbers suggest that Trudeau's comments about small businesses are hurting him. That would be absolutely wrong in the case of EKOS: their numbers today reflect polling completed on Tuesday. In fact, if EKOS put out its numbers as quickly as Nanos does, the media coverage of the past two days would have been very different - and the Tories would have consistently led this site's projected seat count. The weekly EKOS is out. It's the third poll published today, and we have a third different party leading! In fact, each of the three main parties has one first place, one second place and one third place. The excitement continues! The weekly roundup is still to come! Contradictory polls this morning! The daily Nanos for CTV has the Tories up to second place, the Liberals down but still first, and the NDP slumping to third, below 30% for the first time in any poll conducted entirely after the start of the campaign. By contrast, Forum still has the NDP at 36%, clearly ahead of the Liberals and Conservatives. However, a good chunk of the NDP lead in the Forum poll is due to its 53% share among the 18-to-34 age group; discounting that age group due to its lower propensity to vote should show a much tighter race. While Nanos has the Grits holding at 40%+ there, with the NDP at just 20.5%, Forum has the NDP marginally ahead of the two other parties. 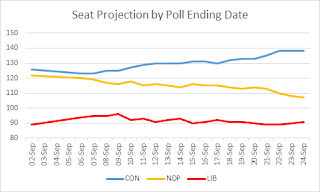 Today's Nanos didn't move the numbers much since yesterday's Nanos showed roughly the same thing in ON; the Forum poll, however, is the first of nine (excluding overlapping Nanos polls) not having the Liberals lead in ON. A blip, or is ON back to a three-way race? This week's EKOS should be out later today, and at that point, I'll do a roundup of the changes that occurred in the past week. 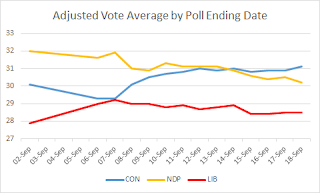 Today's Nanos numbers have the Tories back up (and the NDP back down) to the 28-day average from August 8 to September 4, while the Liberals stay in the lead nationally. It looks like the abysmal Tory numbers over the weekend (26% nationally) were a blip, though of course 28-29% in the polls (and about 30% after adjustment) is still quite weak. Today's Nanos tracking for CTV is out, and for the first time since the start of the campaign, the Liberals are ahead in a poll. What's more, in ON, they are at 43% against 33% for the Tories and just 18% for the NDP. Most probably the ON numbers are exaggerated - small sample size - but as I wrote previously, if the ON anti-Conservative vote goes Liberal, it won't be a fun time for either Harper or Mulcair. The NDP gained two seats in Québec from the Liberals, and are now essentially maxed out. (I have Trudeau winning by 12% in Papineau, though as reported by La Presse, the NDP is trying to appeal to separatist voters' "fantasy" of defeating Trudeau.) The Liberals took one seat from the NDP and four from the Tories elsewhere. So much for infrequent updates. With things so tight, I just can't keep away! Interestingly, the NDP lost a seat despite increasing its vote share: its support in Québec is still trending up, but from now on, this trend will do little for its seat count. Stephen Harper's promise to resign if the Tories lose by just one seat has garnered plenty of attention. But that promise is not at all surprising: since the Conservative vote is the most efficient, losing by "just one seat" likely means losing the popular vote by several points. Trying to hold on to power under those circumstances would have been untenable. The more significant declaration is, rather, that he expects to govern if the Conservatives win the most seats. This potentially means that, in such a case, if the Liberal and NDP defeat the Tory Throne Speech, Stephen Harper would not view a Liberal and/or NDP government as legitimate, and would ask the Governor General for another election rather than let him ask the Liberals or NDP to try forming government. Note that this could happen even if the Tories come in third in the popular vote - the current projection is not far from that! Nanos has started its nightly tracking, and the first batch of results is here. This is the third poll in a row where the Tories are third in the national vote share. This is another good poll for the Liberals in ON: a 6-point lead over the Tories, and a 13-point lead over the NDP. Methodological note: Nanos also produced numbers for the last week of its weekly tracking (which predates the nightly tracking), but only the national numbers are available through CTV. Thus, for now, those numbers are being ignored. If the breakdown becomes available, I will update this projection, but any change would be slight, as that poll would only have a weight of around 2%. Update: The breakdown became available, and unsurprisingly did not cause any change in the seat projection. The only change made to the above numbers is that the Conservative projected vote share went up by 0.1%. BC: The vote shares here are very similar to the national vote shares, but with the Liberals a little lower and the Greens higher. The NDP's solid lead from early August has turned into a wafer thin lead. The Liberal vote is inefficiently distributed: it's looking very difficult for them outside the city of Vancouver and the North Shore. From the provincial numbers, the Greens look far from winning a second seat, but if the regional breakdown in the recent Insights West poll, which gave them 31% on Vancouver Island, is correct, Esquimalt--Saanich--Sooke could go Green. AB: Still solid Conservative territory, but the NDP has a real shot at several Edmonton ridings (Griesbach is their best bet for a second seat) and Lethbridge, and the Liberals also have a shot in Edmonton Centre (a three-way race) and can fantasize about some Calgary ridings. SK: The new map, which created urban ridings, will help the NDP: they will likely win Saskatoon West and Regina--Lewvan, and are in a tight race with the Tories in all other Saskatoon and Regina ridings (except, of course, Ralph Goodale's Wascana). MB: Three of the five polls with specific Manitoba numbers have the Liberals in first place! The NDP is struggling badly, possibly due to the unpopularity of the provincial party. The Grits, after being nearly shut out in 2011 (Kevin Lamoureux won by just 36 votes), are likely to win multiple seats in the Winnipeg area. Note on MB/SK: The current projection assumes that the swing is uniform across MB and SK. This is likely underestimating Liberal support in MB, and overestimating it in SK (with, of course, the reverse for the Tories and NDP). The former means that the Liberals could well be currently ahead in more than 4 MB seats, while the latter has little effect. ON: As discussed in yesterday's post, if the Liberal vote share keeps increasing at the expense of the NDP's, we could end up with a three-way tie in the projected seat count rather soon. More GTA specific numbers would help - if the Liberals are up there more than elsewhere in Ontario (likely since the reverse was true in 2011), it could mean up to 5 more seats for them than with a uniform swing. Indeed, although I currently have the Liberals 2% ahead of the Tories, the latter still marginally lead the ON seat count due to an inefficient distribution of Liberal support. QC: The NDP is projected to win every seat in Québec outside the Island of Montréal (where the Liberals should make small gains) and the area just south of Quebec City (where the Tories should hold on to a few ridings). The only two exceptions are Brossard--Saint-Lambert, a Liberal/NDP tossup, and Lac-Saint-Jean, a Conservative/NDP race. Apart from Louis Plamondon's seat, the Bloc's best shots at avoiding extinction are in Eastern Québec, but Forces et Démocratie is making their arduous task even more difficult. ATL: This is the one area of the country where the Liberals are currently ahead in a majority of seats. The Tories are in danger of being wiped out outside of Southern and Western NB - except in that area, all of their current leads are tenuous. The NDP will keep their existing seats, but have few prospects for gains. Overall, due to the situations in ON and MB, the situation is probably even tighter than in the projection: the Liberals might be closer to 95, while the NDP and Conservatives might be closer to 120. If the Liberal upswing continues, all three parties could soon be between 100 and 120 - setting us up for a potential constitutional crisis after the election... But that's a topic for another day. 1. The 4-seat margin is extremely slim. 2. The NDP actually leads in the popular vote. 3. The Tories have the edge only because I am adjusting vote shares, as described below, in order to account for voter turnout. Without this adjustment, the NDP would have 126 seats, and the Conservatives would be on 119; the Liberals would tie the Tories for second place in the vote share. A few methodological notes about projections for this campaign. - As mentioned above, I am adjusting poll numbers (except for polls explicitly applying a likely voter model) to account for the greater propensity of Conservative supporters to vote. Roughly speaking, I assume that these electors are 10% more likely than supporters of other parties to cast a ballot. (Update: I should note that this is roughly in line with the results of Angus Reid's Institute's likely voter model according to their most recent poll.) This boosts the Conservative vote share by about 1.5%, and depresses the Liberal and NDP vote shares by about 0.5% each. It is important to note that this adjustment may be a bad idea (Conservatives may be demoralized this time), or it may not be sufficient (an even greater adjustment would have been required in 2011). - The way in which I'm weighing polls has changed slightly. The base weight of a poll is still the square root of its sample size. Any polling day within 4 days of the most recent polling day of any poll is given full weight, and the 9 previous polling days are given weights from 0.9 to 0.1. For example, since the current most recent day of polling is September 2, the most recent EKOS/iPolitics poll, conducted from August 26 to September 1, is discounted by a factor 6.4/7: the days from August 29 to September 1 have full weight, while the days from August 26 to 28 have weights 0.7, 0.8 and 0.9. The formula above (which might be changed if the frequency of polling increases) implies that there is a two-week window during which polls count. If the same polling firm has multiple such polls, only the most recent one is given full weight; the second most recent one gets weight sqrt(2)-1, the third gets weight sqrt(3)-sqrt(2), etc. - The change in the background colour is not a blog redesign! That colour was solid blue due to the Conservative majority, and was close to solid blue throughout the 2011 campaign because the Tories were on the cusp of a majority during the whole campaign. The colour is now white with a very slight tinge of blue because we're much closer to a tie than to a Conservative majority. I'm guessing the colour will stay close to white for a while, but it could be red, orange or blue (or still white) at the end of the campaign. When the background is almost white, as it is now, the title of the blog will be in the colour of the leading party; if the background gets dark enough, the title will return to being white. Finally, a note on the frequency of updates: it looks like I'll still be quite busy during the rest of the campaign, so I may not post several updates a day as was the case in 2011, and I will typically not be commenting on individual polls. I might also not get around to doing a mapped projection until the end of the campaign. Nevertheless, I intend to post at least once (and probably 2-3 times) a week in September, and every two days or so in October.